And here's the conclusion to the Ricky Imes story. As with the previous two or three installments, I'm only able to post this on Wednesday because it's a snow day. Thanks, nature! In this storyline I've been trying to recapture the magic from the Golden Age of Fuzzball & Scuzzball, which was the 1990s. F&S co-creator D.F. French and I were in our teens and twenties, and it was a magical time for black & white self-published indie comics. We, like most of the other people doing indie comics, were ironic, cynical, and misanthropic, despite having nothing to complain about. 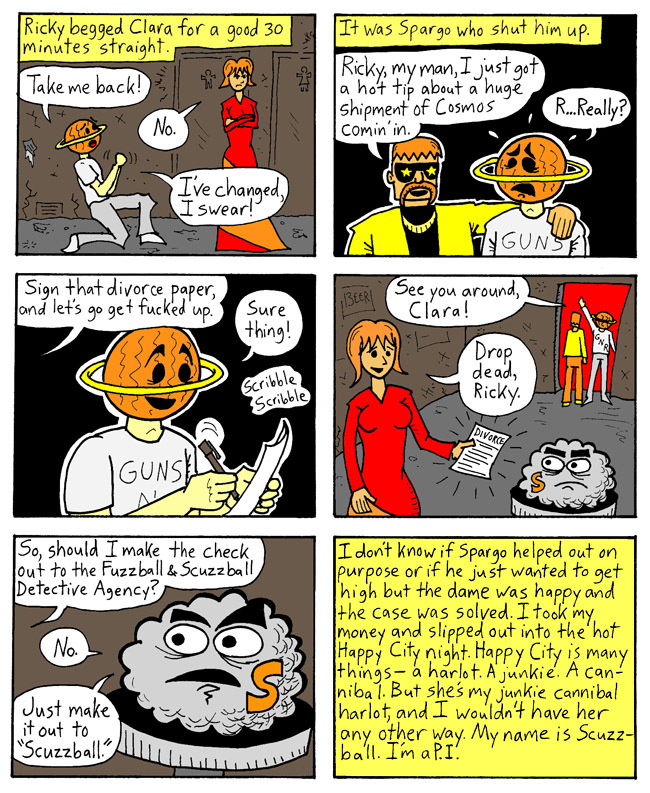 In their original run, Fuzzball & Scuzzball: Private Investigators never actually got paid for solving a case, and in most cases their client died. I'm older now, and I guess wimpier, because I really didn't have any desire to kill off Clara. She gets a happy ending here. You may think I wimped out with Scuzzball getting paid but, to be fair, we all know he's going to go blow that money on booze and Fuzzball's never going to see a cent of it. And keep in mind that Ricky is an addict, who was sober for a minute and maybe going to turn his life around, but now Spargo is leading him off to personal ruin. It's a sad, sad ending for Ricky Imes.